I bet I tricked you with the title to this post. You probably thought this was going to be a secret about how to organize a photowalk, but you'd be wrong. This photowalk tip is about how to get great photos while on photowalks. The tip is simple and it has to do with contrast. Not the type of tonal contrast that we typically discuss in photography, but contrasting subjects. Photowalks are often held in urban areas or parks, and there often isn't much to shoot unless you really force yourself to find interesting subjects. The tip is that the best subjects photographed on photowalks are usually shots which juxtapose two opposite items. The photo on this page is an example. 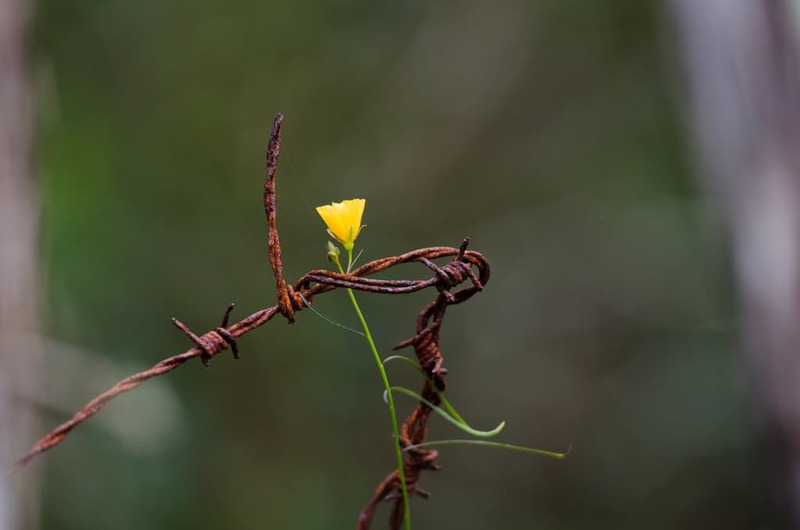 Barbed-wire and flowers are extremely different subjects, so capturing them in one photo is compelling. You will probably find many opposites when on a photowalk. It could dry ground on the edge of a body of water, or light and shadow, or a person and an animal, or a dead leaf next to a green leaf, or just about anything else. Next time you're out shooting and you can't find anything to shoot, just look for opposites to create captivating and creative photos.